When photographing a really big subject, you better have a really wide-angle lens. Better yet, make that a wide-angle zoom. Sigma’s new 8-16mm f/4.5-5.6 DC HSM lens is just that with the equivalent angle of view of a 12-24mm lens on an APS-C DSLR like the Canon 7D. Take a look at the following comparison of different viewing angles. The Sigma 8-16mm lens is the widest ultra-wide angle lens without going into a fisheye. 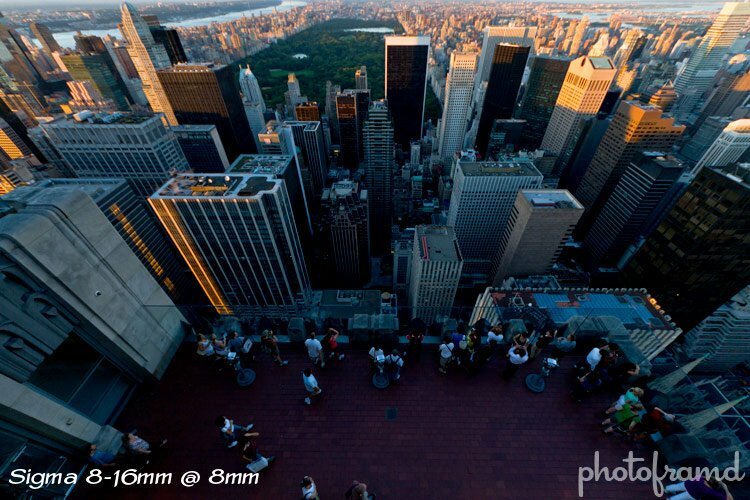 The 8mm range provides an ultra-wide view over lenses like the Canon 10-22mm EF-S @ 10mm. You should also note that there is a clear difference between a Fisheye lens and a Wide-angle lens. Wide-angles are manufactured to minimize/correct for barrel distortion while Fisheye lens are intentionally distorted. You may have heard about Canon’s just announced 8-15mm f/4 L Fisheye lens. This lens is only a true 180º fisheye for full-frame sensors like the Canon 5D Mark II. Since it is called a Fisheye, I would expect it to still distort like a fisheye lens on a APS-C sensor camera like the Canon 7D. (Take a look at my article from the Canon Expo 2010 testing the Canon 8-15mm L lens and you can see the curving of the straight lines, a clear sign of barrel distortion.) As a result, the Sigma 8-16mm lens is the widest wide-angle available for Canon or any other DSLR. 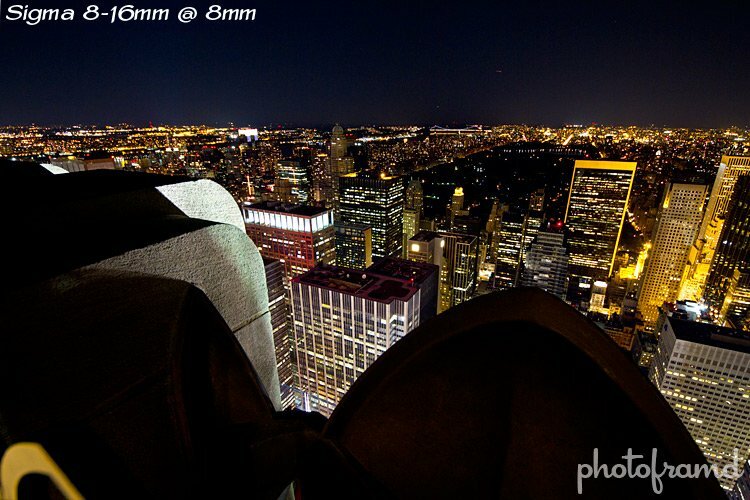 The Sigma 8-16mm lens has an equivalent angle of view of a 12-24mm lens when used DSLR with an APS-C size image sensor. Sigma’s new FLD glass elements has the performance of fluorite glass to compensate for color aberration. One hybrid aspherical lens and two glass mold elements provides excellent correction for distortion and astigmatism. I spent a few days shooting with the Sigma 8-16mm lens on my Canon 7D. The hyper-sonic motor focuses very fast and accurately while producing sharp images with minimal distortion. The lens handles very well. Take a look at the following night shots. 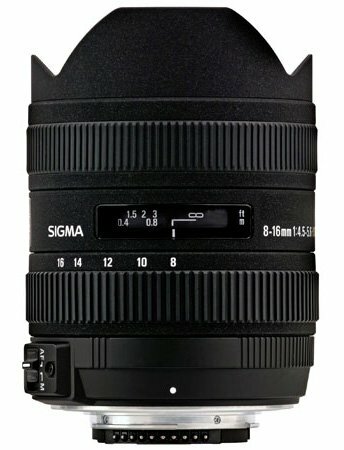 If you are looking for an ultra-wide, you should take a look at the Sigma 8-16mm lens, available in mounts for Canon, Nikon, Sigma, Sony/Minolta and Pentax for under $700 at Adorama. I picked up this lens a few weeks ago, I absolutely love it. I had rented the manual 8mm peleng lens last year, so I knew what to expect from 8mm. I went with the sigma over some of the faster lenses in the same range because 90% of the time I’ll be using it outside. I love the build on the lens, its a very substantial lens that does not leave you thinking “really, this was 700 bucks?”. focus speed is nice and fast. It has a built in petal hood, which is very nice because the lens element on the front is HUGE. I pull off the ring type cover and the lens cover all at the same time, using it more like a cap. on my 7D this lens is a huge amount of fun. It’s a very cool lens. Considering Canon keeps delaying their new fisheye, it’s the only zoom that I would recommend. And, like you said, it’s a great quality lens at a bargain price. The Sigma 8-16mm lens is very unique. It is the widest lens currently available without becoming a fisheye (bending, curving and distorting fringe elements – Canon’s pending 8-15mm lens which is months behind schedule is a fisheye). The Sigma lens is wider than the Canon 10-22mm, very sharp and less expensive. The Sigma lens will also work on both a crop sensor (like the Canon 7D, Rebels, 60D) as well as full-frame sensors like the 5D Mark II. The Canon 10-22mm is an EF-S lens and will only work with crop sensors.The Sigma lens is a DC lens meaning it is designed for a crop sensor like the Canon 7D, Rebels and 60D. It will still mount on a full-frame sensor like the Canon 5D Mark II but it will have vignetting. The other important difference is the f-stop. The Sigma at it’s widest varies from 4.5 to 5.6 while the Canon varies from 3.5 to 4.5. This means that you would need to push the ISO with the Sigma in low-light situation a little more than the Canon. But, it ultimately comes down to whether you want that extra wideness?? Take a look at the comparison photos in the article. That gives you a good sense of what the different lengths mean in the real world. Sigma lens are great quality and value. They are the only third-party lenses (non Canon lenses) that I own and recommend! Thank you for your immediate reply,by the way i am currently have 7D body same as yours. The above information definitely convinced me to buy sigma 8-16mm, however I would like you to reconfirm if i can used it on full frame body although i haven’t tried it yet but i am planning to add in future in my list another full frame body on my camera investment..thank you so much again for the well detailed information. Sorry, I just double checked the Sigma site. It is a DC lens and is meant for a crop sensor not full-frame. It will still mount on a full-frame camera like the Canon 5D Mark II, but it will have vignetting. Thanks for the review, your examples are fabulous. I will definitely take it into consideration. Happy to help! Sigma lenses are the only non-Canon lenses that I own and use. It’s a great company. Quality lenses at a very reasonable price. Here is my thought. To get a true fisheye buy the Canon EF 8-15mm f/4L Fisheye USM Fisheye Ultra-Wide Zoom Lens. 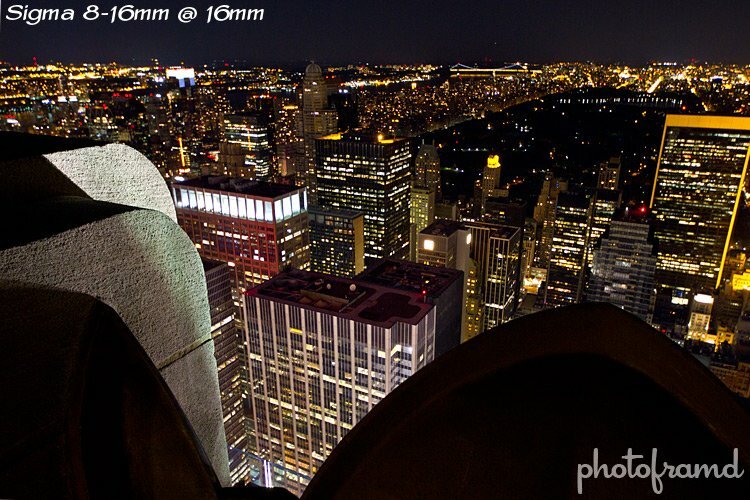 For widest without fisheye effect, simply buy the Sigma 8-16mm. I’m gunning for Sigma 8-16mm because I’m not really a fan of distort image like fisheye from sea. The Sigma 8-16mm is a great lens! 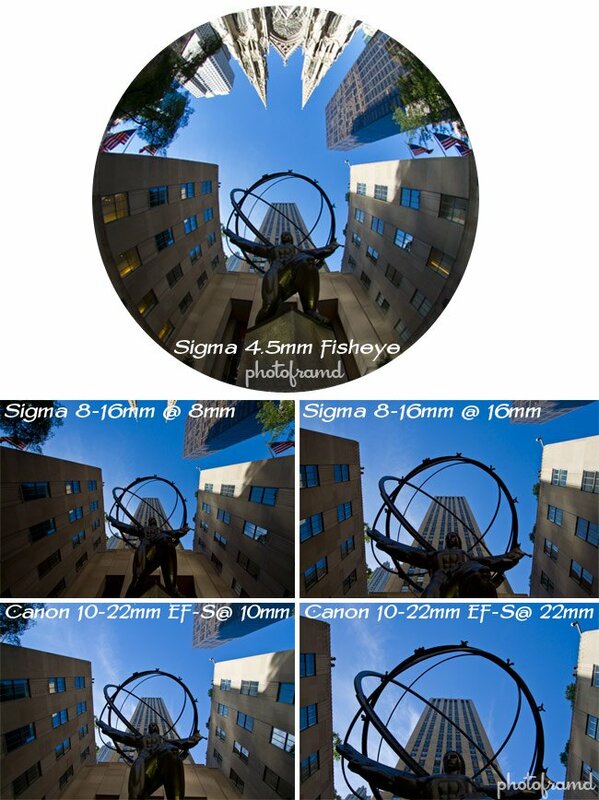 And, considering the cost of the Canon L, it would be much cheaper to get one of the Sigma prime fisheyes – either the 4.5mm f/2.8 Circular Fisheye or the 10mm f/2.8 Diagonal Fisheye. In fact, you could buy both and it would still be cheaper than the Canon L and you would have an f/2.8! If I ever wanted a fisheye len, I would buy Rokinon FE8M-C 8mm F3.5 Fisheye Lens for $289.00 which is 12 times cheaper than new Canon 8mm-15mm fisheye len, 6 times cheaper than Sigma 4.5mm f/2.8 Circular Fisheye, and 3.6 times cheaper than 10mm f/2.8 Diagonal Fisheye. Keep in mind – A bargain lens is only as good as the images it captures. If the images are not usable, then that bargain is really a waste of money. I know both Canon and Sigma produce quality lenses which will deliver great images. I would not trust a Rokinon lens in a make-or-break assignment.